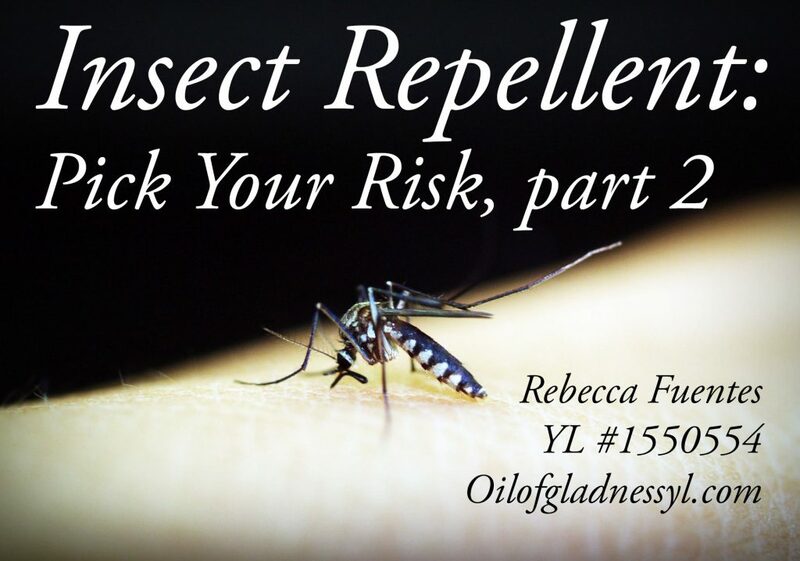 Last week, We discussed two of the big names in insect repellents: Permethrin and DEET. Permethrin is an insecticide that, in addition to be used in some insect repellents, is also used in many large-scale spraying programs. Permethrin is had some serious side effects, especially if it’s ingested (it’s scary stuff). DEET is better known, more widely used in OTC insect repellents, and has its own health concerns. However, even the Environmental Working Group points out that, when used in concentrations below 30% and according to the instructions, the actual risks are low. DEET is the best-known insect repellent out there, but there are other options with fewer risks. Frankly, not all of us are comfortable using DEET (yours truly included). We still need effective protection from insects and the possibility of insect-borne diseases, and it needs to be safe for our whole family–babies and toddlers included. Permethrin certainly doesn’t fit the bill, and DEET isn’t safe for young children. We Don’t Use DEET, so What Else Is There? Thankfully, there are more insect repellents with alternative active ingredients available. Consumers can choose from Picaridin, IR3535, Lemon Eucalyptus, and a variety of botanical repellents. Like I mentioned last week, in many areas of the US (and worldwide), insect repellent isn’t just about avoiding itchy bug bites. It’s about avoiding the diseases carried by mosquitoes and ticks. Lyme disease and Rocky Mountain spotted fever, both carried by ticks, are particularly serious. When choosing a repellent, you the consumer, need to be aware of the disease potential of your area and activity. It may affect which repellent you prefer. A good repellent should lower the risk of being bitten while not posing health risks in return. Picaridin is a synthetic compound originally developed from plants in the black pepper genus (piper). It has been available in Europe for 20 years and is the most popular insect repellent there. In the US, it has only been available since 2005, when it received FDA approval. Both the EWG and Appalachian Mountain Club have found Picaridin-based repellents to be effective and low risk. Picaridin is as effective at repelling mosquitoes as DEET, and at a lower concentration (20% for Picaridin vs 30% for DEET). However, it doesn’t provide protection from ticks for as long. Picaridin only provides protection for 2 hours, so it must be reapplied more often than DEET. Picaridian does look like a safer option than DEET. It doesn’t degrade plastics like DEET. It is odorless, non-sticky, and non-greasy. It is less likely to irritate skin than DEET, although some people have experienced skin irritation from it. It can also cause eye irritation if it comes into contact with the eye from a spray or unwashed hands. Only 6% of Picaridin is absorbed through human skin, and it is passed out of the body within 24 hours. It is not neurotoxic, and even cases of ingestion have not produced what researchers call “major effects.” Most cases of effect did not require medical attention. The most severe reaction listed was vomiting. Because of it’s name, IR3535 isn’t as well know as an insect repellent. It has a 30-year history of use in Europe and was approved for use in the US in 1999. It is one of the few insect repellents recommended for use by pregnant women by the French Ministery of Health during the Zika virus and Chikungunya outbreaks. While IR3535 is effective against most species of mosquitoes (the exception is the mosquito which carries malaria), it is exceptionally effective against ticks. In studies, IR3535 provided the longest protection against deer ticks, which carry Lyme disease. It protected against the ticks twice as long as DEET, Picaridin, or Lemon Eucalyptus. However, the EWG warns to be careful of which product containing IR3535 you choose. Some are combinations of sunscreen an insect repellent, which require frequent reapplication for the sun protection. This can lead to overuse of the insect repellent when it is unnecessary. The main safety concerns with IR3535 are eye irritation and its effect on certain plastics. It can cause plastic to degrade, like DEET does. It’s best to apply with something other than a spray to avoid contact with the eyes. Animals studies on ingestion risks resulted in vomiting and minor hemorrhaging in the digestive tract. It also resulted in lowered blood pressure. While external use of IR3535 is safe on children and even babies, it shouldn’t be applied to parts of the body or clothing a child might chew on. Children shouldn’t apply it themselves, and hands should always be washed after application (this goes for any insect repellent). Lemon Eucalyptus or Oil of Lemon Eucalyptus (OoLE) shouldn’t be confused with a pure, unadultured essential oil of eucalyptus. Instead, it is the trade name for an intensified extract of the lemon eucalyptus tree. The intensification process increases on component of the extract (PMD) from 1% to 65%. While it’s usually advertised as a natural product, understand that to produce this level of effectiveness requires some tinkering. 65% PMD eucalyptus oil isn’t available in nature. Many products contain both oil of lemon eucalyptus (the intensified product) and straight PMD as active ingredients. The combined products (those with both PMD and OoLE), showed an efficacy similar to DEET against mosquitoes and ticks. However, products that contained just OoLE needed to be reapplied every two hours to remain effective. OoLE and PMD are relatively new on the insect repellent scene, and there has been a lot of confusion between them and lemon eucalyptus essential oil, which evaporates more quickly and isn’t effective for very long. It isn’t recommended to use products containing PMD or OoLE on children under 3, as there is very little safety information available. The intensified, refined product is classified as a biochemical pesticide. Because of this classification, it is not required to have as much safety testing as the previous repellents we’ve discussed. It can cause skin irritation. Some of the ingredients naturally found in the original extract are listed as potential allergens. Like all other repellents, it shouldn’t be ingested or come in contact with the eyes. There are many choices out there. They aren’t all equal, so it’s important to know the risks and drawbacks of each choice. Botanical repellents rely on either fatty oils, like soy, sunflower, or sesame oils, or essential oils, or a combination of both, to repel insects. The active ingredients in most botanical repellents are considered generally safe by the EPA and therefore aren’t registered. This does, mean, however, that they don’t have the history of efficacy testing that other active ingredients have. To evaluate whether they are worth using means evaluating information available about the active ingredients they list. 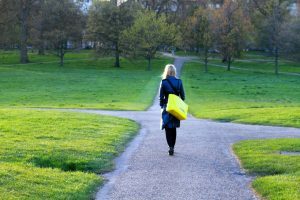 What does this mean for those of us who, really, would prefer to pick a botanical, plant-based insect repellent for our daily outdoor needs? We have to be picky about where we buy. We have to evaluate if this company knows enough about essential oils and their quality to produce an effective product. Any insect repellent that isn’t effective is a waste of money and leaves us and our families open to the risk of insect-borne diseases. There are hundreds of studies available on which essential oils repel insects; the oils themselves are effective if the quality is good. The challenge for companies making botanical insect repellents (aside from quality) is making them last. Blending essential oils with fatty oils like soybean oil, sunflower oil, or sesame oil, which have their own repellent properties, helps them last longer, and if the fatty oil is good quality, it’s beneficial to the skin. My choice by far, because I know I can trust the quality of the oils in the product, is Young Living’s Insect Repellent. All the oils it contains are effective at repelling mosquitoes, ticks, or other insects, and it uses sesame oil as it’s fatty oil carrier. Sesame oil is effective for repelling insects on its own and has been used by the Chinese for centuries to repel insects from crops, livestock, and fields. It’s also beneficial for the skin, which is why it’s widely used in the beauty industry. While the testing on it is not available to the public, as it contains proprietary information, many consumers have done their own tests, showing that ticks would not cross a line of the insect repellent, and testing it(effectively) against mosquito-infested areas. It is safe for infants, older children, and pregnant moms, although care should be taken that it doesn’t get rubbed in an eye, and hands should be washed after applying it. None of the essential oils in the product are highly concentrated enough to cause problems if a small amount is ingested, but it won’t taste good and may irritate the sensitive mucus membranes in the mouth. I would reapply about every two hours. What risk will you take? You choose. For many of us, myself included, insect repellent is about comfort. We don’t want bites. We don’t want itchy bumps afterward. Enjoying the outdoors means not waving bugs away from our faces and legs. For many other parts of the US, insect repellent is about preventing diseases. For people who cannot go hiking without the risk of Lyme disease, or to the beach without the risk of West Nile virus, they will have to evaluate what they are comfortable using and what will be effective against the insects they might encounter. I have tried my best to provide a non-alarmist, well-supported overview of the insect repellents available and their relative risks. What I can’t do is make the choice for anyone but my family. Every family and individual knows what they are comfortable using.